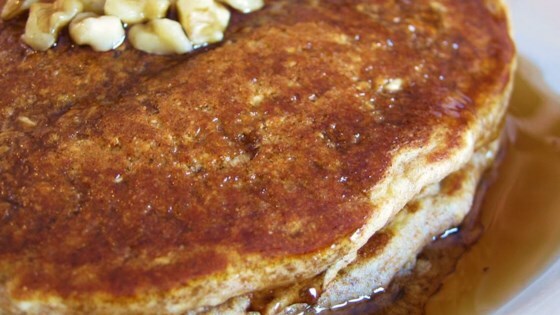 "If you like Harvest Grain N' Nut pancakes, I have the recipe for you. Nutty, moist and tasty pancakes! This is the BEST pancake recipe I've tried, and I've tried many..."
Grind the oats in a blender or food processor until fine. In a large bowl, combine ground oats, whole wheat flour, baking soda, baking powder, and salt. In another bowl, combine buttermilk, milk, oil, egg, and sugar with an electric mixer until smooth. Mix wet ingredients into dry with a few swift strokes. Stir in nuts, if desired. Lightly oil a skillet or griddle, and preheat it to medium heat. Ladle 1/3 cup of the batter onto the hot skillet; cook the pancakes for 2 to 4 minutes per side, or until brown. These pancakes tasted like baking soda and they were too heavy. Amounts for the oats and flour have been revised per the submitters request.